Kuala Selangor Indoor stadium, the venue of MSS Selangor chess championship for 2012 edition, is about 50 kilometers away from GiLoCatur's home in Shah Alam. Today, the championship began where all the 240 competing players from ten districts will fight to being respective category champions and winners including two of GiLoCatur's children. 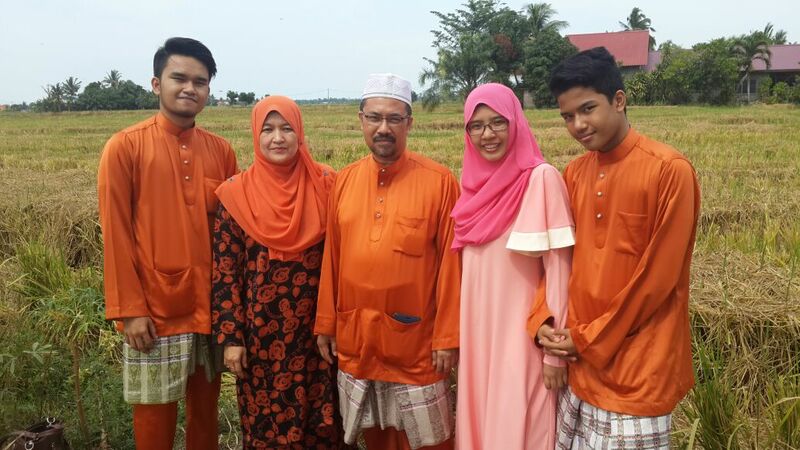 Anis, GiLoCatur's only daughter, represents Kuala Selangor district for the second year. She competes in the P15 (Under 15 Girls) category. Meanwhile, her younger 10-year-old Fahim represents Petaling Perdana district also for the second time. Fahim competes in the L12 (Under 12 Boys) category. 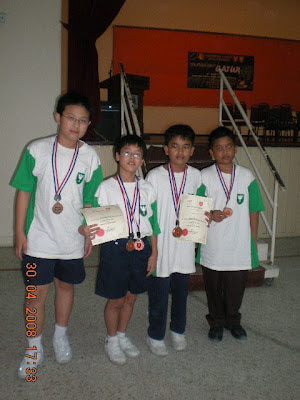 Their elder brother can not join them in this year championship because he moved to a school in Kuala Lumpur. GiLoCatur would like to congratulate PPD Kuala Selangor for providing the best ever venue of the championship in the past five years. It has set a benchmark for other PPDs to follow. There are ten school districts in Selangor. It was nine while GiLoCatur was in school in 1980s. Due to rapid growth, the Petaling district is divided into two - Petaling Utama and Petaling Perdana. SK Bukit Jelutong, Fahim's school, is in the Petaling Perdana district. Fikri had represented the district for four consecutive years from 2008 to 2011 while his younger sister, Anis, had represented two years in a row in 2009 and 2010. Since last year, Anis has represented Kuala Selangor district. Hopefully, she will continue to play for Kuala Selangor district until she completes her secondary school. There are two events played in three days of competition. The first one is the Individual event where all players may play against their own district contingent. The players play seven rounds of an-hour-per-player game. Four of them in the first day and the other three in the second day. The Team category is the other event. Four players will team up and play against other district team. The format of play is five rounds of 25-minute-per-player for this event. One round is played in the second day while the rest i.e. four rounds are played in the final day. So, who will be the champions in the Individual event? Which district team to dominate the Team event? Please come again to find out. 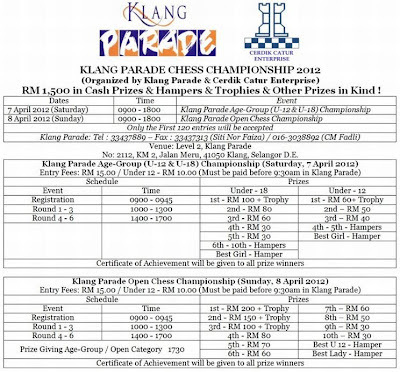 The Selangor state MSS Chess Championship for 2012 edition will start today. This year PPD Kuala Selangor becomes the host after PPD Sabak Bernam hosted two years consecutively - 2010 & 2011. This year edition is the fifth time GiLoCatur attends the championship and be part of. But it will be a nostalgic for GiLoCatur and wife since Fikri will not be part of it after being involved for four years. 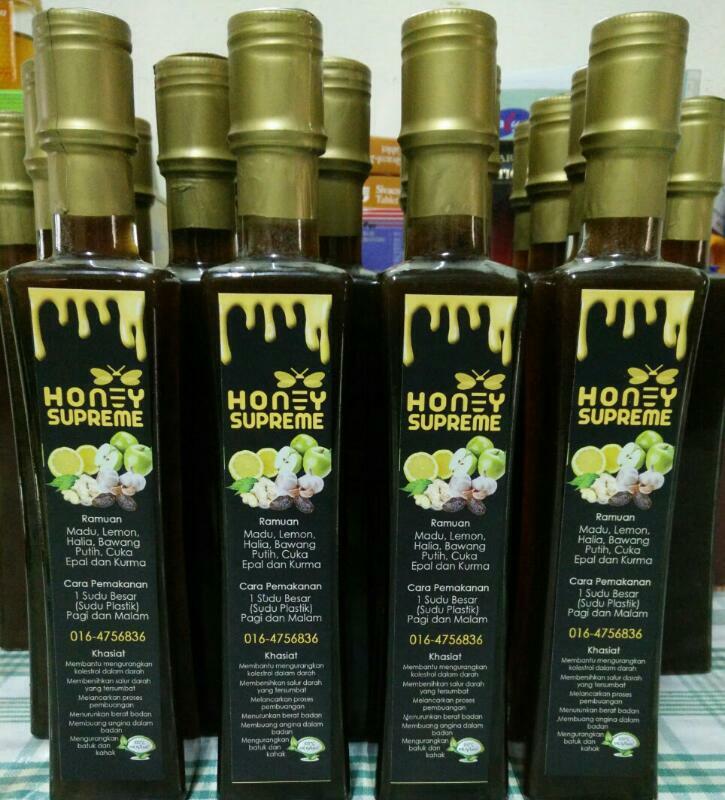 Why Fikri does not take part in the MSS Selangor chess championship this year? The answer is Fikri not schooling in Selangor anymore. He had moved from SMK Seksyen 18 Shah Alam to SM Sains Alam Shah which is located in Cheras, Kuala Lumpur. 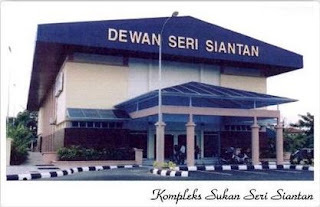 GiLoCatur was at Dewan Seri Siantan Gombak in April 2008, the first time Fikri represented PPD Petaling Perdana. Twelve years old at that time, he played in L12 category. In 2008 edition, Fikri began his PPD Petaling Perdana team collaboration with Low Jun Keat. With two other team members, Fikri and Jun Keat won the third place in L12 Team category. Both of them were also among the winners in the L12 Individual category. The 2009 edition was held in Sepang. The championship was held earlier that year. Fikri's younger sister, Anis Fariha, made her debut in this edition. Along with Jun Keat's elder brother, both Fikri and Jun Keat dominated the MSSS L15 Team category for three consecutive years. Unfortunately, for two years in a row Fikri failed to be in the MSS Selangor chess contingent. Anis, on the other hand, continued her journey in MSSM chess championship by being a member of 2009 Selangor P12 Team along with the two Puteri sisters - Rifqah and Munajjah. 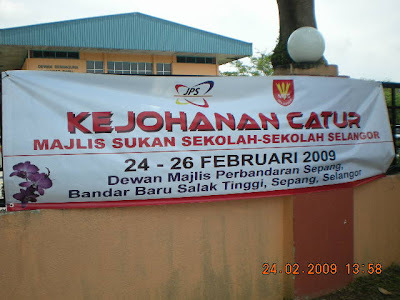 Both 2010 and 2011 editions were held in Sungai Besar. The 2010 edition is the sweetest memory for him. 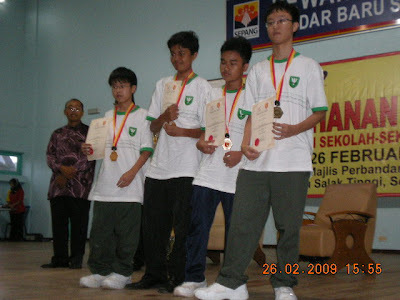 He emerged champion in both L15 individual and team categories.In 2010, both Fikri and Juan Keat was joined by Suniil to make up the formidable MSSM Selangor L15 team. Once again PPD Sabak Bernam hosted the Selangor MSS state chess championship in 2011. Fahim had his maiden championship in this edition representing PPD Petaling Perdana for the first time. Thus, Fikri had to babysit Fahim who was 9 years old. After representing PPD Petaling Perdana for two consecutive years, in 2011 edition for the first time Anis became part of PPD Kuala Selangor chess contingent since she got the offer to school at SM Sains Kuala Selangor. Fikri managed to defend his L15 Team title only along with Jun Keat and Suniil. The trio along with Irfan Haqqim Azhar of PPD Kuala Selangor missed their golden chance to become the champion of L15 Team event in the MSSM chess championship in Penang. Hakeem Nash Ibrahim was the other team member of the golden PPD Petaling Perdana L15 team. The L15 Individual category changed baton to Roshan Singh whom Fikri began to know in 2008 edition. Fikri and Anis continued to represent Selangor in the MSSM chess championship. Meanwhile, Fahim began his chess journey in the Selangor MSS chess championship along with his schoolmate, Faqih. Both of them emerged the first runner up in the L12 Team event representing PPD Petaling Perdana. Can they emerge champion in this year edition along with another SKBJ school mate? Let's wait and see. GiLoCatur needs to sign off now to begin an hour-drive to Kuala Selangor to be part of the 2012 MSS Selangor chess championship. May Allah bless both Anis and Fahim. Hope both of them will excel in the championship and make their elder brother proud. Good Luck to Anis & Fahim! Good luck to all 40 x 6 = 240 competing players in the 2012 MSSS chess championship. BE THERE FROM 25th TO 27th APRIL 2012! 40 X 6 X 10! YEOP, MOH KITE LAWAN BLITZ!! SKBD Fide Rated Chess Tournament Postponed! GiLoCatur was informed that the above chess tournament is postponed!!! Please, take note. Which Team Emerged Champion in the PERCAWI Labour Day Team Chess Tournament? Dare to play against me? Who do you think Aziz Farhan played against in the above match up? When you are busy, the time flies. GiLoCatur felt last weekend is just yesterday. But in fact, two more days for next weekend. The coming weekend will be 7th and 8th April. Last weekend, GiLoCatur and family were at the IIUM (International Islamic University of Malaysia). There were FOUR chess tournaments last weekend - 4th IIUM chess invitational, UPM Rapid Chess Open, 3rd KL Scholastic chess championship and UTM Rapid Chess Open. GiLoCatur believes the results and winners of all the tournaments are already known. Go to Ng6 and Fireyrook chess blogs here and here to view the photo gallery of the 4th IIUM chess invitational. The detail pairings and results can be viewed at Open, Under 21 and Under 12. Go to MSSMKL chess blog here to find out the winners and results of the 3rd KL Scholastic chess championship. If you are interested to know the pairings and results of the UPM Rapid chess open, please visit this link. 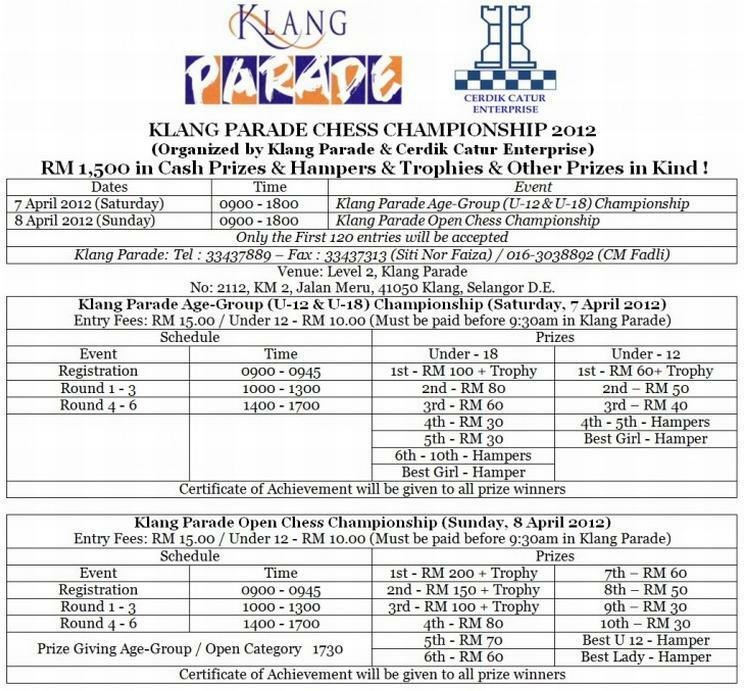 To all the chess players in Klang Valley, the Klang Parade should be where you are this weekend. Check out the tournament's details below. 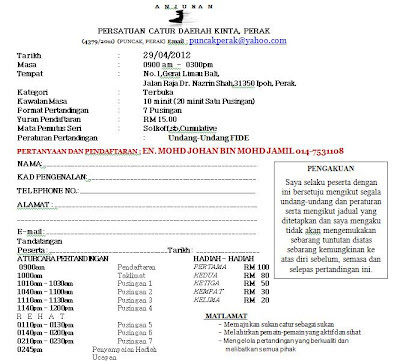 While all the chess players in Perak especially in Sungai Siput area please go to Sekolah Rendah Sungai Siput on Sunday. A chess tournament called SUPEM catur open as per below info will be being held and organized by Abu Bakar Martin.